On the Tuesday, he coached the underdog Chicago Black Hawks to their second Stanley Cup win, and his players carried him on their shoulders — by Saturday, he was just another major-league umpire calling strikes on the grass at Boston’s Fenway Park. Accorded little chances of entering the playoffs, the Hawks, with an odd assortment of rookies and old-timers, responded to Stewart’s fiery leadership to upset one favored club after the other, including the Toronto Maple Leafs, champions of the National Hockey League. The miracle man of hockey, Montreal’s Gazette called him. Some other adjectives that the newspapermen of the day applied to Stewart: chunky (Montreal Gazette); plumpish, partly bald (The Day); bald-headed pilot (Boston Globe); big-time ice pilot (ibid. ); pudgy, bald sports veteran (ibid. ); the Little General (Boston Globe); bald-headed William (Gazette); ordinarily soft-spoken little man (ibid.). It wasn’t true, what was sometimes said of him: that he’d never coached a hockey team before he was hired by Chicago owner Major Frederic McLaughlin. In fact, though he’d only ever played the game on shinny rinks, he had coached high-school hockey in his hometown, Boston, going on to steer the hockey team at the Massachusetts Institute of Technology for seven seasons. He’d played some serious ball, too, including stints with the Montreal Royals and the Chicago White Sox. He started his umpiring in 1930, graduating to the majors in 1933. By the time he retired in 1955, be was considered the dean of National League arbiters. He took part in four All-Star games and five World Series. Stewart did, memorably, forfeit a game in Boston’s favour in 1933 after one of Stewart’s predecessors as Chicago coach, Tommy Gorman, (1) punched him and (2) took his team off the ice to protest a tying Bruin goal. No officer of the law appeared, however, and Stewart returned to the Canadien bench and after a heated dispute with Dandurand, the latter finally rose from his seat, went behind the bench and stood there, continuing to direct his team without any undue inconvenience. And at the start of the second period Leo was back on the bench and stayed there for the rest of the game. That’s the first I’ve heard of NHL coaches sharing the players’ seating, but I guess that’s how it worked then. (Is there enough evidence here to credit Stewart with the innovation of upright, ambulatory coaches? I don’t suppose so.) 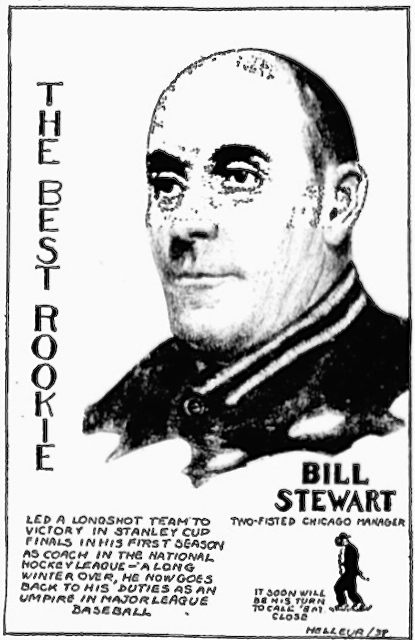 Also worth a mention: this wasn’t the first time Stewart had ejected a coach in the Forum: earlier that year, he’d tossed Chicago’s Clem Loughlin — the man he’d eventually succeed as coach of the Black Hawks. 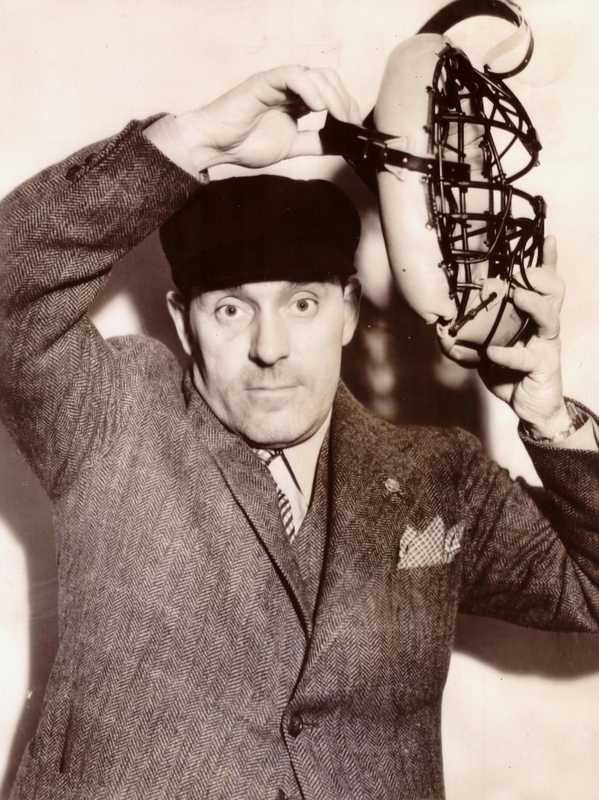 Hockey refereeing was harder than baseball umpiring, Stewart said in 1937. In the latter, “it’s either a strike or a ball,” while hockey involved monitoring not only the puck but the behaviour of 12 speeding men. A referee’s most important function on the ice? Watching the blueline for offsides. “If you miss a trip or a bit of scragging or interference,” he said, “you can depend on the players to even it up among themselves, but if you miss a blue line offside and a goal results you can’t call back that goal, and it may mean the game. 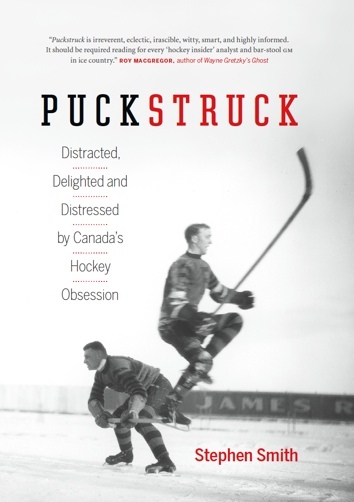 But no matter what you do, you can’t be right in everybody’s opinion.”The toughest hockey game he oversaw was the longest ever played, March 24, 1936, the Stanley Cup semi-final game when Detroit and the Montreal Maroons trudged into six overtime periods before the Red Wings’ Mud Bruneteau finally scored. Stewart recalled stumbling into a Montreal restaurant at three in the morning, after six hours on his skates. Three or four of the Hawks have a certain amount of mechanical ability, but only God could help them think by sending each a new set of brains. A pair of veteran players were appointed to replace him, Paul Thompson and Carl Voss, but the team fared no better under their direction, and they missed the playoffs. Whether he got to see the trophy that represented the Hawks’ reward is an open question. The Stanley Cup, famously, was not in the building when Chicago beat Toronto on April 12 — it wasn’t even in Chicago. It only arrived on Thursday, which is the same day Stewart left town. Hard to say whether they met up — maybe on the platform at Union Station? Black Hawks centreman Doc Romnes picked up the coach and Mrs. Stewart at their hotel and drove them to catch their train out — they were the first passengers in his brand-new station wagon. In Boston, Stewart’s Saturday started at Fenway Park, where he umpired a pre-season game between the city’s two big-league teams, the Red Sox and the Bees. Fans enthusiastically greeted Stewart; the Bees won. In the evening, Boston fêted the coach in the ballroom at the Hotel Bradford. Three thousand people were expected, though I don’t know if they all ended up coming. Ford Frick was there, president of baseball’s National League, along with members of both the Red Sox and Bees. On the hockey side, NHL president Frank Calder was on hand with Art Ross, Charles Adams, and Weston Adams from the Bruins.